Three Voivod shows in 4 days. There was a show on the 18th as well but I didn’t make it thinking it was a badge/wristband only show. Unfortunately it wasn’t and only about 40 people showed up from what I was told. Oh well. Yesterday’s show was pretty cool. The Galaxy Room was an old closed venue that got a quick facelift and a coat of paint to host shows for SxSW. This show was sponsored by Brooklyn Vegans and “M is for Montreal”. Vegans. Alrighty. This particular show featured Roky Erickson (of whom I am still unfamiliar with), Andrew WK, Voivod and a bunch of other bands I have never heard of…mostly hispter bands. I was there for Voivod, of course. I arrived about an hour before the show just to make sure I had a place in the venue. These SxSW shows can get filled pretty quickly sometimes, no matter who is playing. The band arrived shortly after and I got to have a few drinks and talk with them a bit, especially with Dan Mongrain from Martyr who is a cool dude and a great guitar player. It was oddly cold outside yesterday and had rained earl in the morning. It was 75 for a good solid week and then a front rolled through and it was in the 40s all day. Sucked. The band got introduced by some dude from Montreal who is apparently pretty famous up there. He ran through a quick repertoire of Canadian metal bands. Voivod was slated to play at 315PM but the bands were running behind. I think they went on around 345. This was to be a short set, only 6 songs. Unfortunately technical problems cut the set by one song. As with the other shows the band was great. They all looked to be having fun again until the amp/chord issue happened. After tha was resolved they had time to do one final song, Astronomy Domine. At that point they were a little more frustrated. They were slated to leave for Canada by bus immediately after the show. When they finished their set I helped them load off of the stage, said my thank yous and goodbyes and went foraging for food. 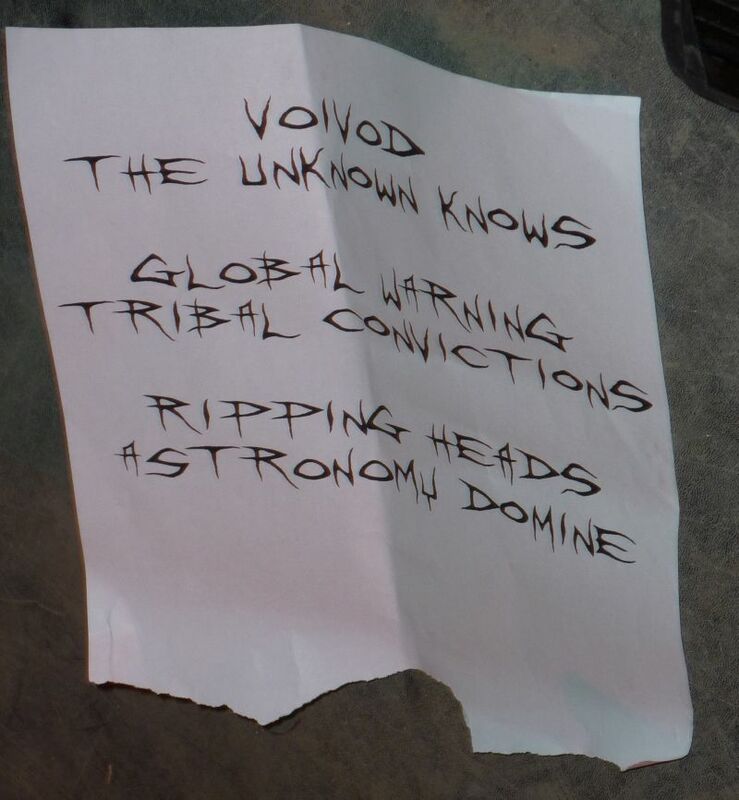 As stated in my first of these Voivod reviews, I was never a big fan of the early work, but after seeing them live 3 times this week, I’ll do my best to see them anytime that I can. Great musicians, nice guys, good times all around. No need to post more pics of them, you know what they look like! Now, this is what I consider a Metal “feel good” story… making new friends and their Voivod. Great stuff you have shared!